"'Into Kisia’s conquered north, a Levanti empire is born. There is no calm after the storm." When I read We Ride the Storm last year, I had no idea how much I would end up loving it or that it would become the start of a new trilogy that I would be endlessly anticipating as it continues to be released. 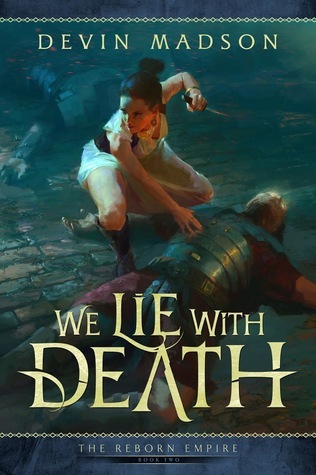 We Lie With Death is an intricate, gritty, richly developed, and highly satisfying follow-up that I sincerely enjoyed and cannot recommend enough to others to pick up. The mixture of racial tension, political intrigue, religious strife, and many other thematic elements were developed even more in this installment and allowed the plot to be propelled even further. Before I even read the first page of the book, Madson managed to exceed my expectation by including a "the story so far" recap and detailed character list that I always immensely appreciate in fantasy books. This is the perfect way to refresh your memory before diving into the sequel, as it was short but filled with just enough information to catch your up on the biggest details from the first book. We Lie With Death has a much different pace than We Ride the Storm, but it somehow managed to be just as captivating and exciting as the first book. The pacing this time around felt a bit slower, a bit more plotting, and more complex and unpredictable than before. There were a lot of mysteries introduced in the first book that were further explored or answered in this book in ways that I never saw coming and that have left satisfied with what I know, but still yearning to know more in future books. The characters remained some of the most compelling components of the story. We continue to follow Rah, Miko, and Cassandra, as well as the newest addition, Dishiva. I didn't expect to have a new POV from Dishiva, but I ended up feeling extremely grateful to have it and follow things from her station in the story. Cassandra and Miko remain two incredibly compelling characters who are both exceptionally strong in their own unique ways. They are also both rather cunning, but aren't without faults or the ability to make mistakes or false judgments. Rah continued to be a fascinating character to follow as well, though I feel he had slightly less development than his female counterparts. His journey is still fascinating to follow and I liked seeing how he handles all of his life circumstances, but he just didn't seem as changed as the others. This book also allowed us to explore some new locations of the world created by Madson, which I found rather exciting, and I also liked meeting some new characters, such as the Witchdoctor, as well as becoming reacquainted with old ones, such as Empress Hana. I felt that there was a lot more to delve deeper into regarding religions, tensions between various peoples, and individual characters themselves that has turned this into an even more complex and page-turning story. One of the best things about Madson's writing is her ability to mix serious themes and tones with humor and a somewhat more lighthearted-narrative at times. Don't get me wrong--this is not a lighthearted story, but it is one that has a great balance of darkness and violence with moments that help to keep things more entertaining and realistic. As I mentioned above, the pacing is slower than the first book, but it's still not a slow pace. There is more plotting and discussions and revelations, but there's also plenty of action to keep things moving forward. As a quick side note, I'd like to note that this book was initially scheduled to be release on March 28th, 2019, but it has been (temporarily) pushed back. I do not have an updated publication date, but don't let that stop you from starting this series and looking forward to the sequel's release! It is absolutely worth it. Overall, I've given We Lie With Death a well-deserved five stars!